Bold, colorful and humorous describes James Rizzi’s paintings. We viewed a Power Point presentation of Rizzi’s art and then the kids did “Rizzi” type drawings of their own. White construction paper, crayons and a black Sharpie were all the supplies needed. Check out the 4th Grade version of “The Rizzi Way” art. For complete directions go to the 4th Grade Projects Gallery in the sidebar. 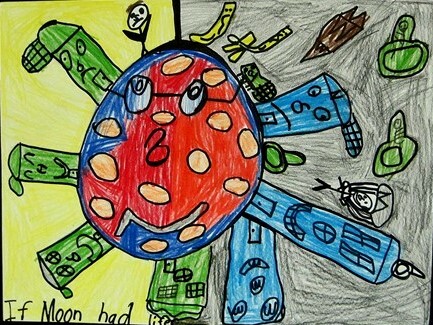 This entry was posted in 4th Grade and tagged 4th grade, activities for kids, art activities for kids, art class, james rizzi, james rizzi art for kids, the rizzi way. Bookmark the permalink.